Hollywood is a constant inspiration in designing innovative concept cars that push the boundaries of what can be accomplished today. Whether it is due to the souped-up engines, sleek lines, high-tech gadgets or spectacular car chases, the following 10 vehicles have become major film stars that have captured the hearts of car enthusiasts around the world. The Aston Martin DB5 is the ultimate James Bond car. Driven by Sean Connery in the 1960s movies and resurrected in the 1990s blockbusters, the luxury grand tourer epitomizes 007 sophistication. Powered by a 282-horsepower, all-aluminum, 4-liter engine, the Italian coupe was packed with every gadget and weapon a spy needs, including mounted guns, an oil slick dispenser and revolving license plates. In hot pursuit of the bad guys, the hard-boiled cop Frank Bullitt rips through the hilly streets of San Francisco in a Ford Mustang GT 390. The gripping scene is widely recognized as “one of the most famous car chases ever filmed”, and the longest one too — the chase lasts almost 10 minutes! It revolutionized Hollywood’s approach to on-location shooting. Movie star Steve McQueen navigated the muscle car during close-up shots, but his stunt double was behind the wheel as it hurtled down the hills at 90 miles per hour. One of the two Mustangs used while filming the movie was so badly damaged that it had to be scrapped after filming the movie. In 2001 and 2008, Ford paid tribute to the iconic Hollywood car by releasing a limited edition GT with the “Bullitt” nameplate. 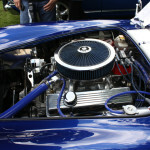 From the pep rally to the drive-in to the drag race, “Grease” offered up “a visual buffet of 1950s American” hot rods. However, none achieved more fame than Greased Lightning, a 1948 Ford De Luxe that the crooning T-Birds gang described in the song “Greased Lightning” as “systematic, hydromatic and ultramatic” with its “four barrel quads”, “chrome-plated rods” and “purple pitched taillights and 30-inch fins”. The renovated classic car not only defeats its rival “Hell’s Chariot“, a black convertible Merc with flames, but it also flies off into the sunset carrying the hopelessly devoted lovers Danny and Sandy. A replica of the modified Ford XB Falcon GT Interceptor. Photo by sv1ambo on Flickr / CC BY 2.0. The modified 1973 Ford Falcon XB GT might not have been enough to entice Max Rockatansky to stay on the police force, but it was certainly the perfect ride for a vengeful Mad Max as he chased bad guys through the dystopian wasteland. A young Mel Gibson pilots the Australian-engineered car, which was beefed up for the movie with eight side exhaust pipes, a non-functioning supercharger on the hood and a dual overhead cam engine producing 600 horsepower. The black coupe was further modified for the film’s sequel to include retrofitted gas tanks complete with an explosive trap. Relying on a futuristic 1.21-gigawatt nuclear engine, the stainless steel DeLorean is transformed into a homemade time machine in the “Back to the Future” trilogy. In his DVD commentary, Director Robert Zemeckis notes that the DeLorean was chosen because it looked like an alien spaceship with its roof-hinged gullwing doors. Hollywood artists modified the stock model, which was only produced from 1981-82, to include time and speed circuits, rear nuclear reactor vents and a coffee grinder that used household waste to power the flux capacitor. Of all the Hollywood incarnations of the famous Batmobile, Tim Burton’s 1989 version is our favorite. Under Anton Furst, the iconic vehicle took on a darker, bulkier design. The Caped Crusader, played by Michael Keating, tore through Gotham City on a spliced chassis made from two Impalas powered by a Chevy V8. The custom-built armor-proof body dropped the front Batmask for a jet turbine intake while the stockier rear end debuted with sculpted fins and cold air intakes for the afterburner. The gadget-laden cockpit included a voice-command system that allowed Batman to launch on-board spherical bombs, grappling hooks or oil slick dispensers. The Lexus concept car from Minority Report. Image courtesy of Craig Howell on Flickr / CC BY 2.0. Although Tom Cruise was the star of Steven Spielberg’s 2002 sci-fi thriller “Minority Report,” it was the futuristic Lexus that stole the show. Specifically designed by Lexus for the movie to reflect the future vision of what a car should be in 2054, this cherry sports coupe was equipped with such high-tech gadgetry as night vision, DNA recognition entry, gesture controls, a windshield projection instrument panel and color-changing capabilities. The fully functioning concept car included an electric engine that was powered by 47 batteries and could continuously run at 70 mph. Both the original 1969 British version and the 2003 remake of “The Italian Job” catapulted the stylish Mini Cooper into pop culture stardom. While viewers only see three Minis — one each in red, white and blue — the films utilized more than 30 vehicles to produce the high-speed heist chases. Since the compact spy mobiles are the only storyline link between the two films, modern director F. Gary Gray remarked that the Minis are truly a part of the cast. Remarkably, only a few modifications were needed to make the trio of cars perform their acrobatic stunts. Co-starring alongside Shia LeBeouf, the alien robot Bumblebee gets a massive makeover in the 2007 “Transformers” from a simple Volkswagen Beetle to a beat-up 1976 Chevrolet Camaro and finally to a souped-up Camaro concept. The sleek rally yellow paint is accentuated with a black stripe, riveted hood scoop and transforming parts that include a plasma cannon and missile launcher. With this 2008 update in the Batman franchise, fans got their first glimpse of the hero’s armored tank, Tumbler. The new version of the Batmobile featured machine guns mounted on the nose and an auto-adjusting driver’s seat that lies flat when Attack Mode is employed. The vehicle is equipped with a 5.7-liter Chevy V8 engine that accelerates to 60 mph in 5 seconds, a vector-controlled jet and ejecting front wheels that transform the Tumbler into the Batpod. What’s your favorite Hollywood Car? Let us know in the comments below! Hollywood blockbusters continue to rely on innovative rides to define their heroes and attract audiences to the box office. The cars featured in Hollywood movies inspire innovation and fuel the imagination of automakers and fans alike. In 2015, “Mad Max: Fury Road,” “Kingsman” and “Mission Impossible: 5” will be aiming to impress us with their sleek style, slick chases and jaw-dropping specs.